Let me tell you about HeartBEEts. 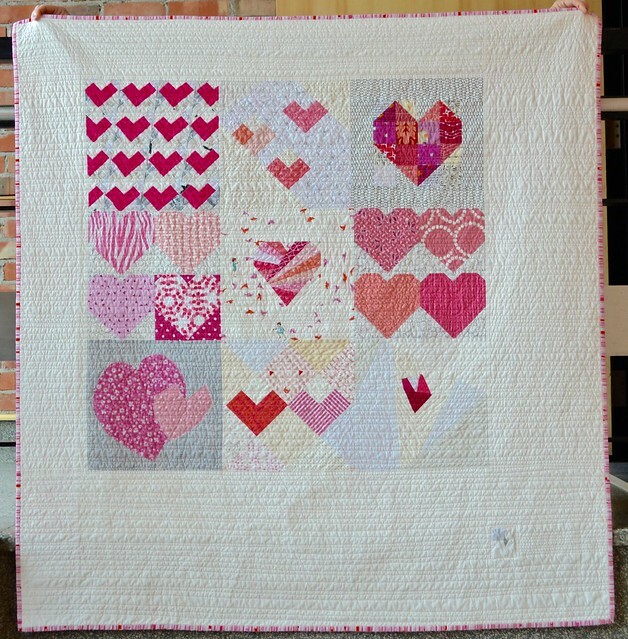 She is a baby quilt that the members of Bee Sewcial made for another member, Marci, who has just had a new baby girl. 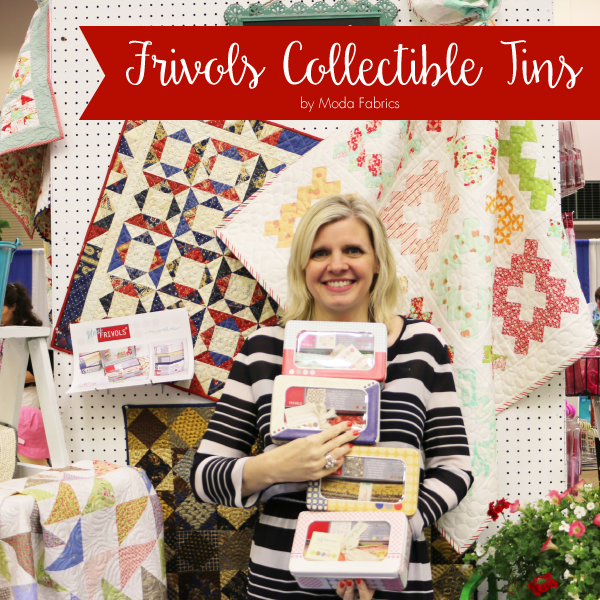 Marci blogs at Marci Girl Designs. Now that she is safely in Marci's hands, I can tell you all about her. 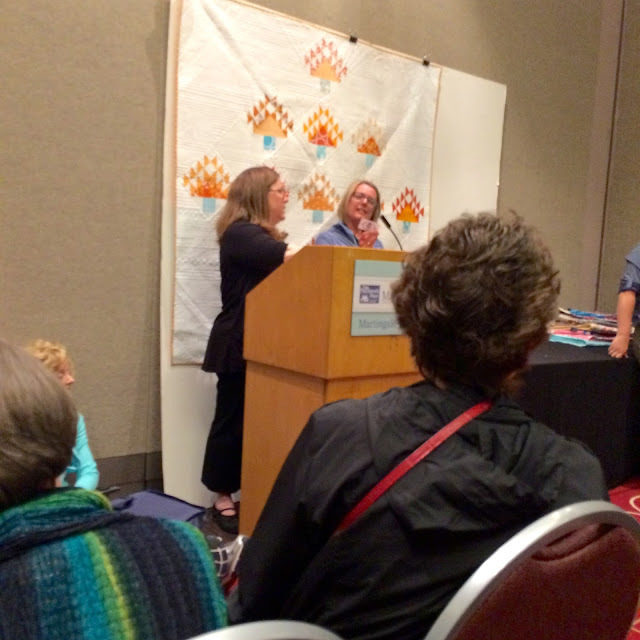 A bunch of us met up at QuiltCon in February, including Marci. She let us know that the baby she was expecting was a girl and that she was into pink for baby things. 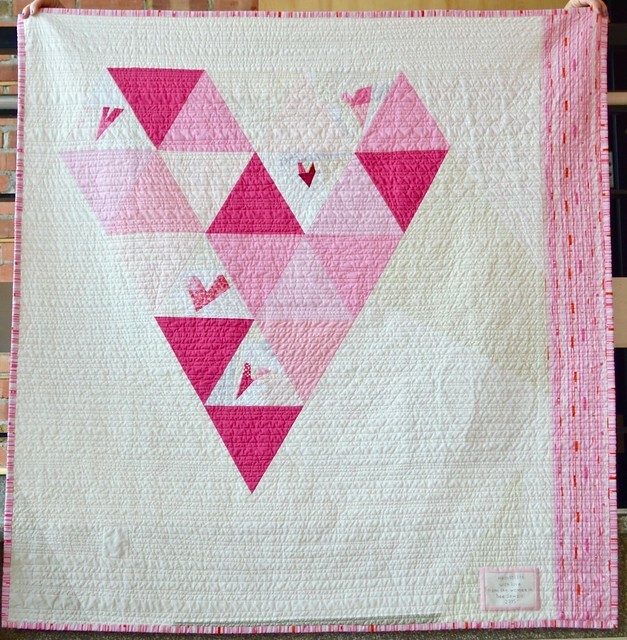 The rest of us decided to make her a surprise baby quilt, and in keeping with the Bee Sewcial way, the theme/inspiration was hearts and the colour was pink and low volume. 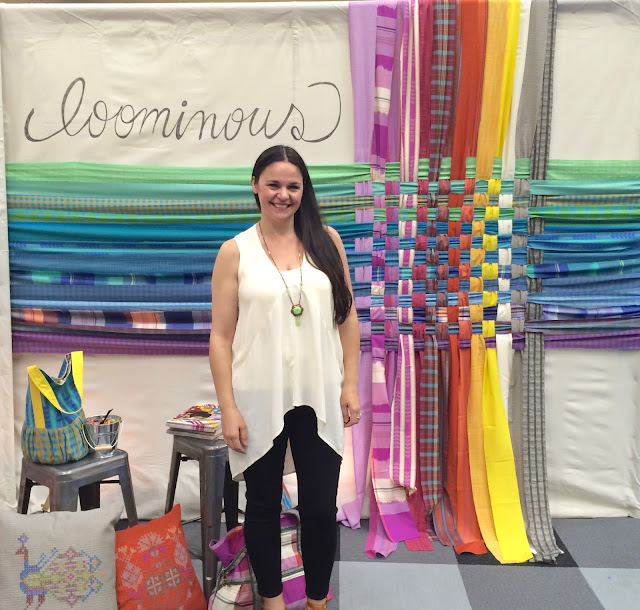 Our one deviation from the usual Bee Sewcial rules was to use prints, not just solids. 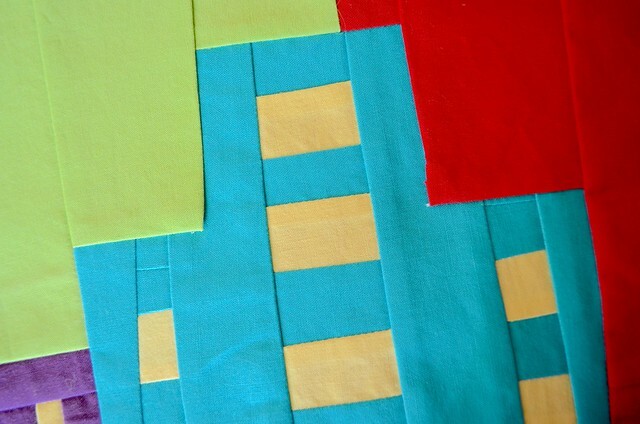 Stephanie, who blogs at Spontaneous Threads collected the blocks and pieced the top. 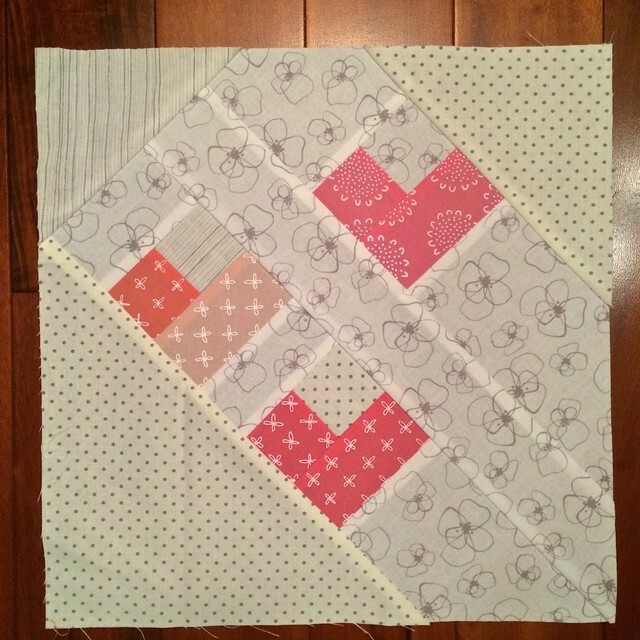 Debbie, who blogs at A Quilter's Table created the back, with a block addition from Stephanie. 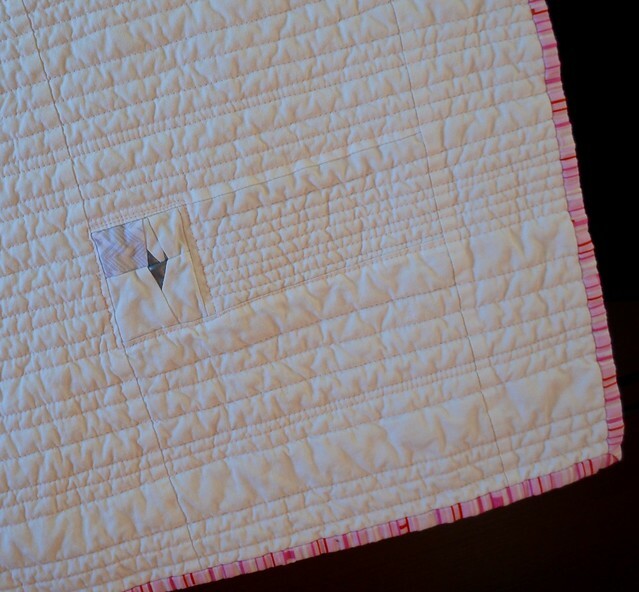 I did the quilting and binding. This block was made by Hillary, who blogs at Entropy Always Wins. 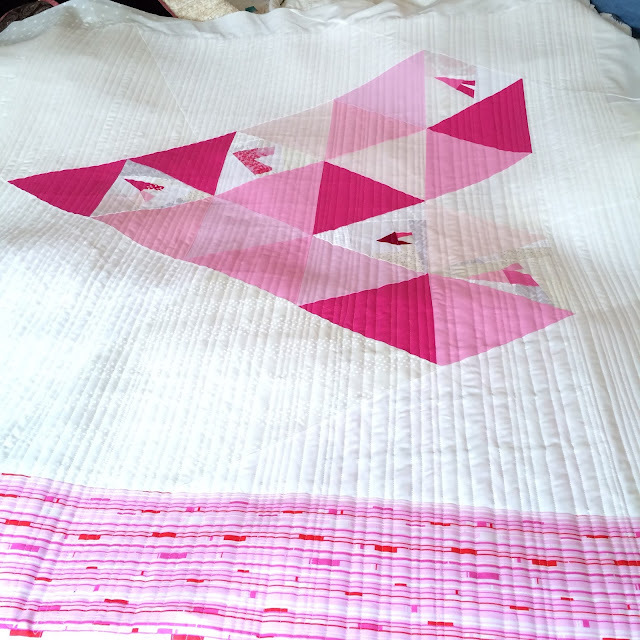 I adore this block, and I have to say I was glad of the industrial strength longarm machine as I was quilting it - all those seams really gave my machine a workout thumping through them. 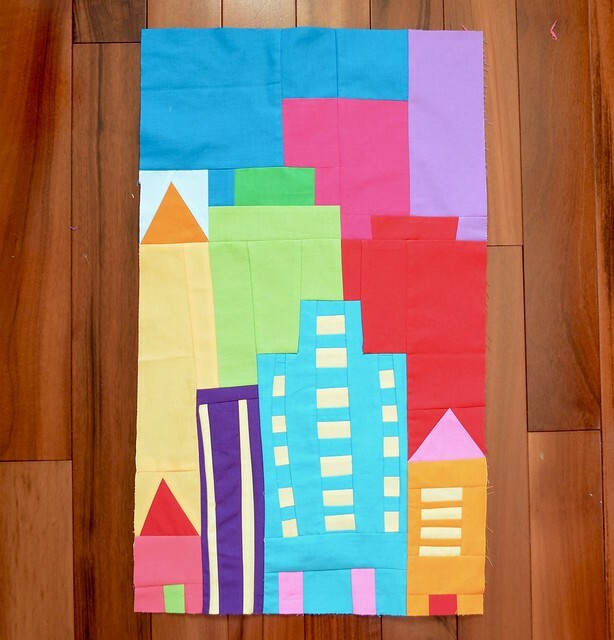 This block was made by Melissa, who blogs at We Shall Sew. This one was made by Diane, who blogs at Random thoughts... do or "di". 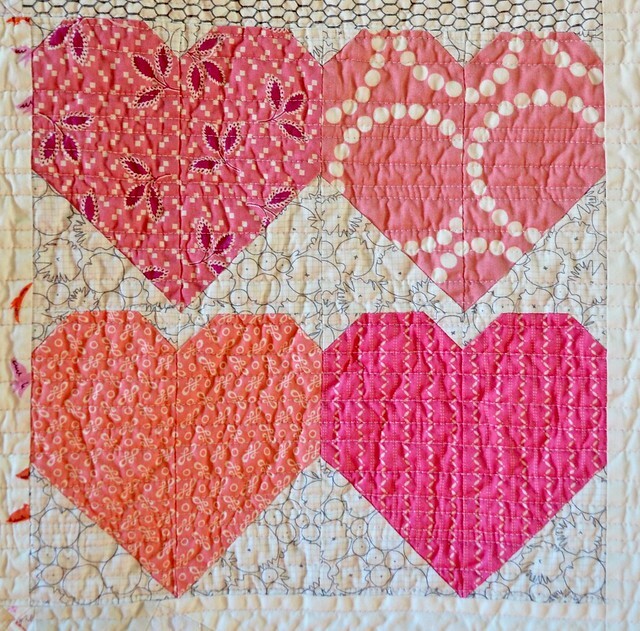 This block was made by Kari, who blogs at Craft Happy. 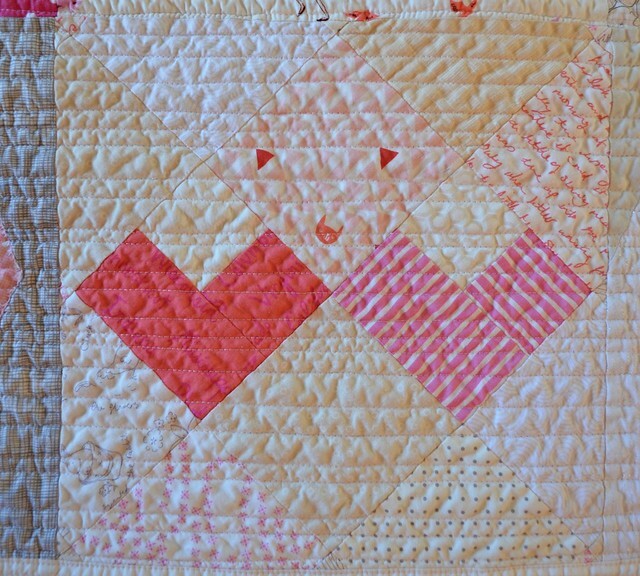 This block was made by Felicity, who blogs at Felicity Quilts. 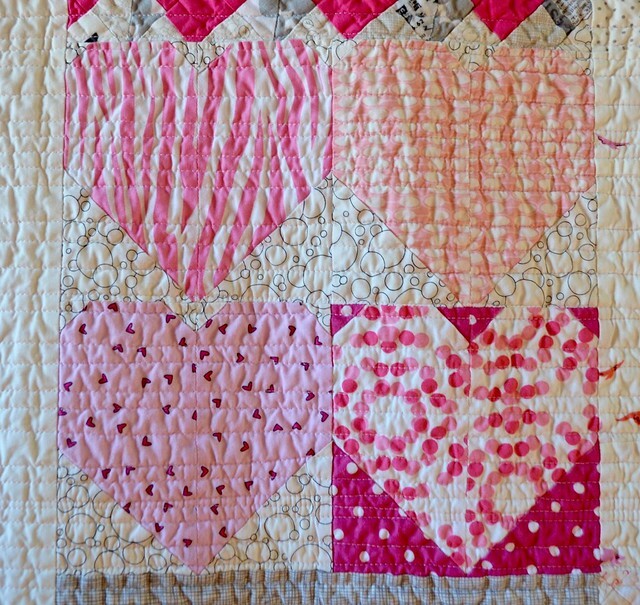 This block was also made by Diane, who blogs at Random thoughts... do or "di". 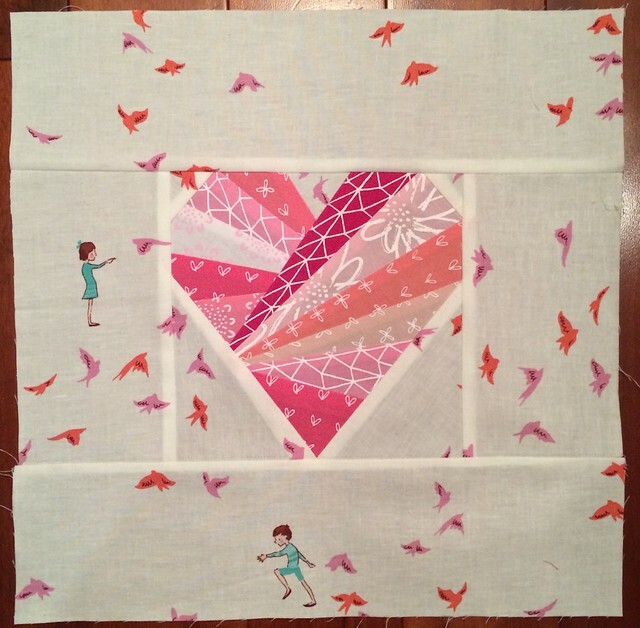 This block was made by Stephanie, who blogs at Spontaneous Threads. She made a similar one that is part of the back. Stephanie also added this tiny little grey heart. She cautioned me not to sew through it. The wonder of this tiny little heart is better understood when light (like the flash of a camera) shines on it. It is made from nano particle fabric and it shines that light right back at you. You can read more about Stephanie's nano particle adventures here. 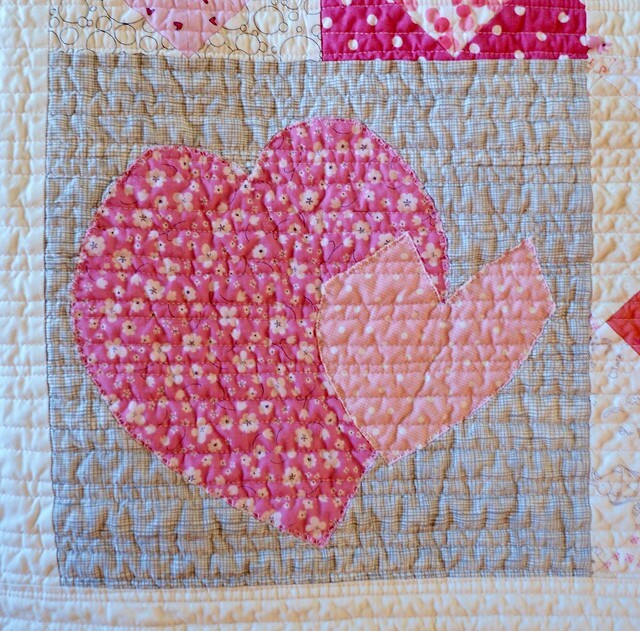 I did not know about the magic of this little heart when I was quilting and photographing the quilt and I generally turn the flash off on my camera. 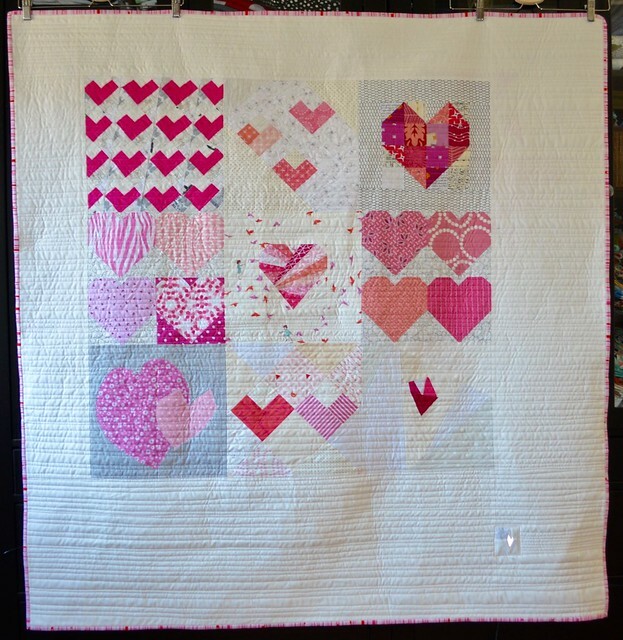 Here is the one whole quilt picture I have with the little heart shining, it is before the quilt had a wash and dry. That little heart sure holds its own with the bigger ones! This block was made by me. 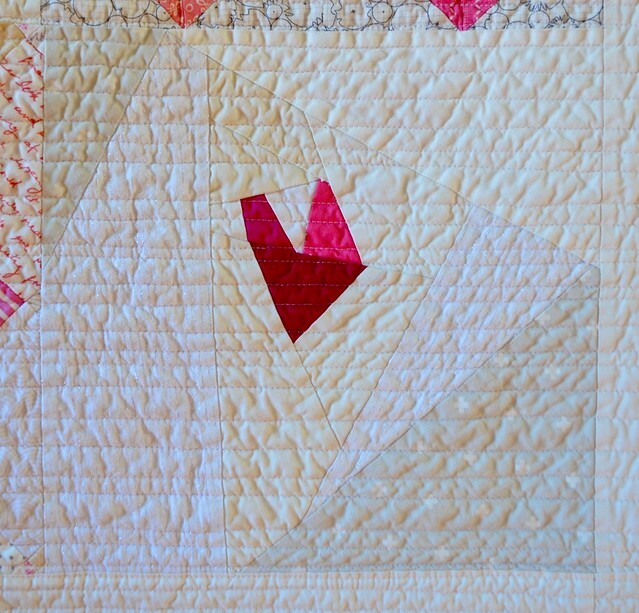 Here it is before quilting. 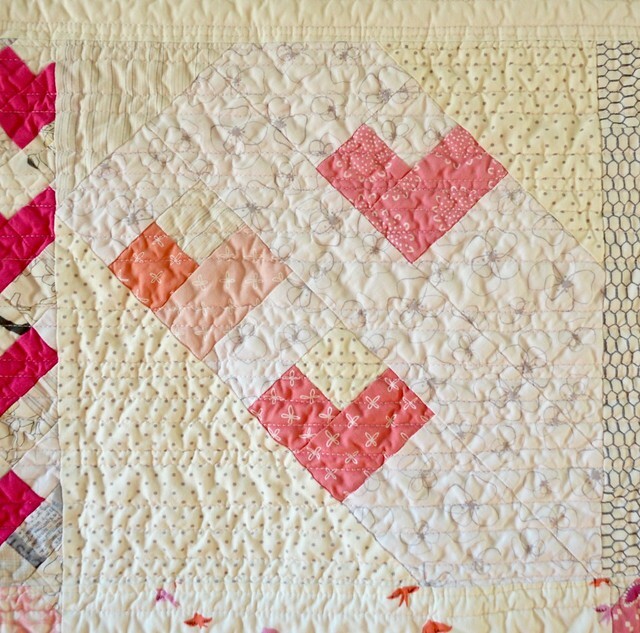 I used a lovely free pattern from Pieced by Number, go here. 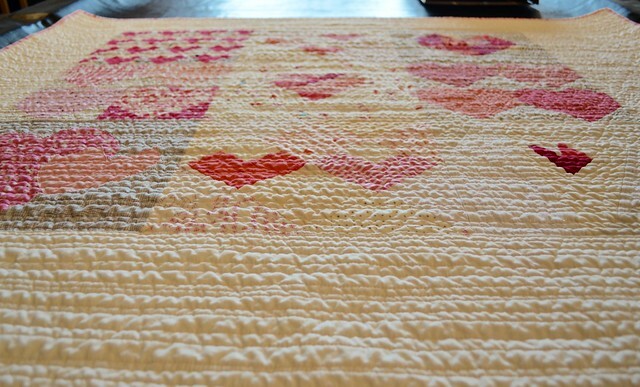 I also pulled out a bunch of my hand screened fabrics from Karen Lewis Textiles for the heart. And I could not resist using the bird and children print from the Wee Wanderer collection by Sarah Jane as the background. This is the other block I made. You can see it a bit better here. 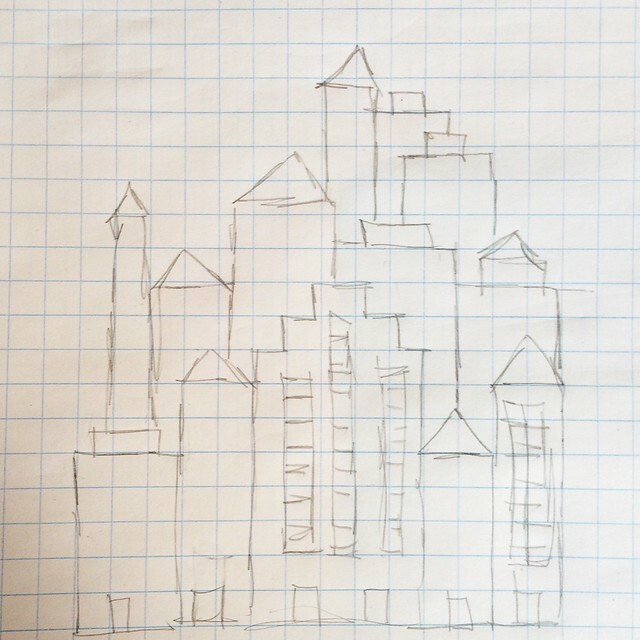 It is improv in straight lines, a bit asymmetrical and quirky. 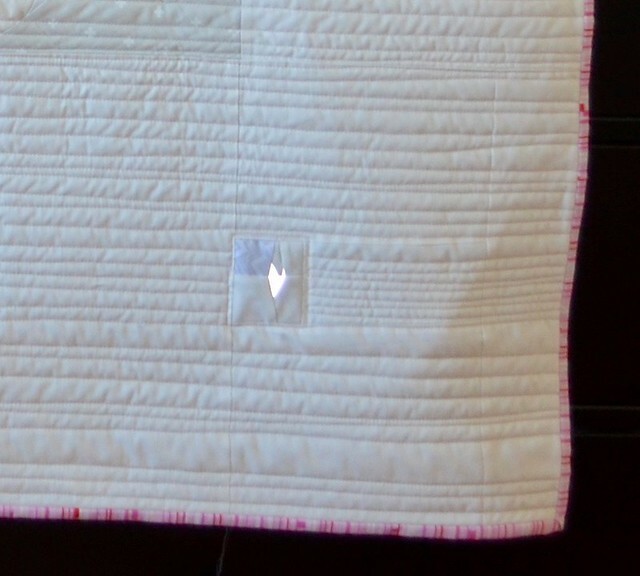 Not surprisingly, I quilted this quilt with unevenly spaced straightish lines. I used a light pink Aurifil 50wt thread for the top and the bottom. 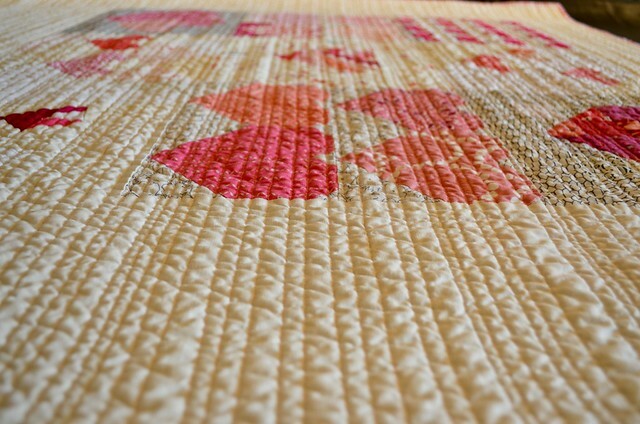 It's hard to see but the light pink thread gives the whole quilt just a little bit more warmth. 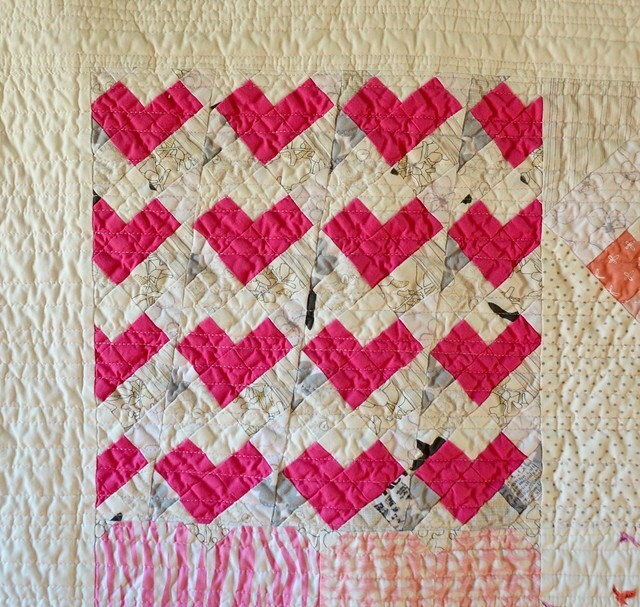 I think by now you might have guessed how much I love this little quilt and I know Marci loves it too. 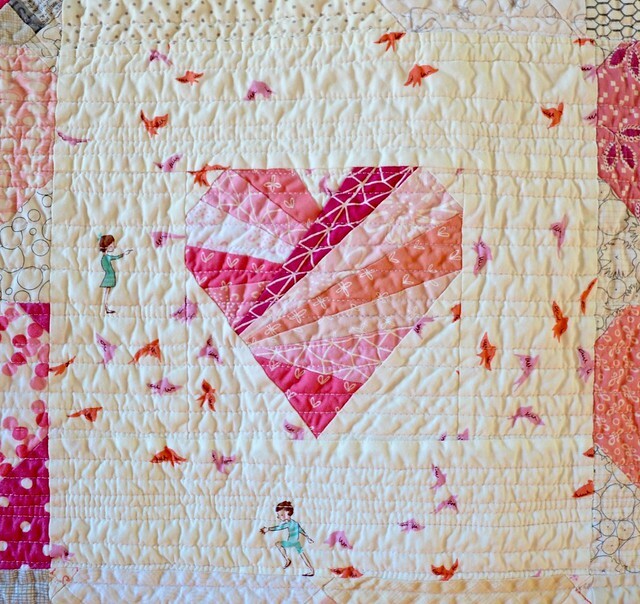 Debbie, from A Quilter's Table designed and pieced the back, with a block from Stephanie added in. I am in love with this back. I had to show you another photo of the back. It really is just the other front. This photo is before the quilt was trimmed or washed and you can just sort of see the many low volume white prints that Debbie used. The label says it all, this was such a fun project to make for a brand new baby. 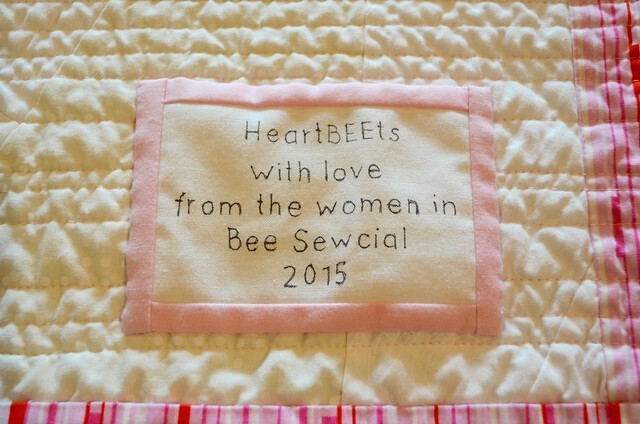 The members of Bee Sewcial were all involved in each step of making this quilt - there was even a lot of thought and discussion about how to name her. Our newest member, Karen, who blogs at CapitolaQuilter joined too late to make a block but helped with the naming and other decisions as we went. And I had to show you the whole quilt again, the members of the bee did such a great job creating this quilt. I am honoured to be part of such a creative and generous group of women. A couple of days before I left to attend Spring 2015 Quilt Market in Minneapolis, just over a week ago, I decided that I needed a nice bag. 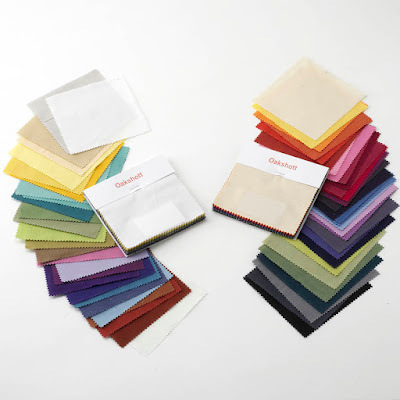 As you walk the floor at quilt market, people give you things - information, samples, cards - and you need a place to put them and then there is sample spree where an extra bag is always handy. 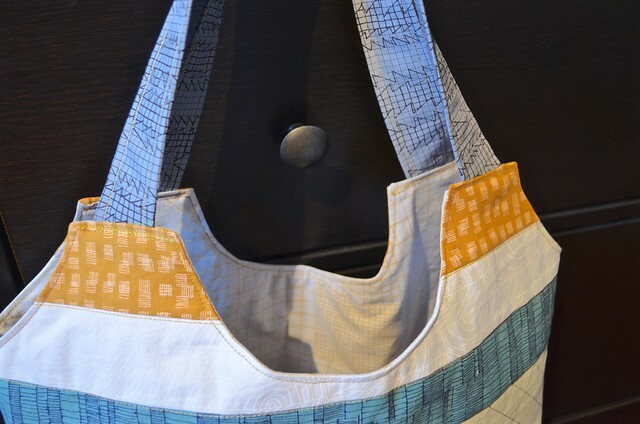 So I made Ayumi's Big Patchwork Tote from Make It, Take It using my favourite Doe fabric. 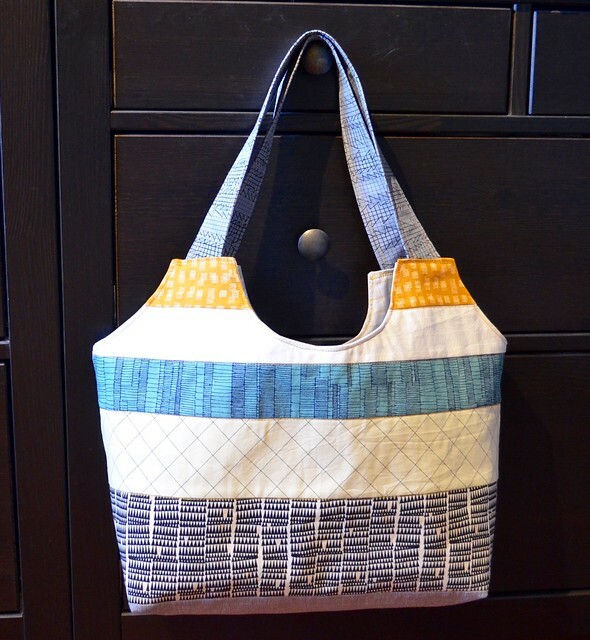 This bag is easy and beautiful - I plan to make many others. I lined it in a Doe print too. 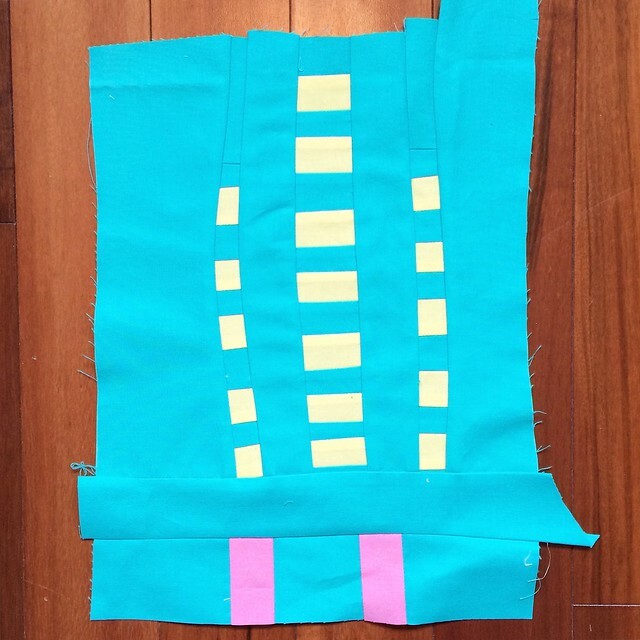 My only modification was to top stitch along the fabric strips as I have a long standing issue with adhesive stabilizers - it is total user error but they don't often stick well for me. It is a pretty addition and took almost no time at all. The first day of Quilt Market is called school house and is a day filled with short presentations by authors, designers, fabric companies, etc. In each time slot there are 15 or 20 options and you pick the one you like and go. 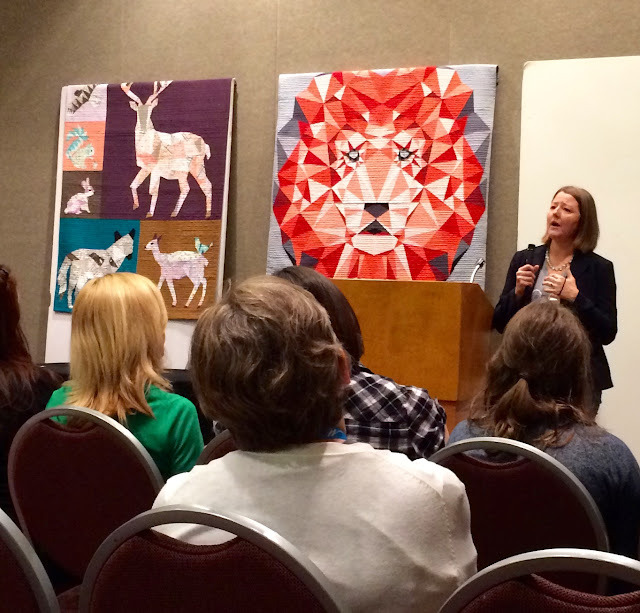 Of course, I attended Krista's (Poppyprint) packed session presenting her book Make It, Take It. Krista was brilliant and the room was packed and people were squeezing in to sit on the floor! You can see Krista just glowing here, I took this right after her session finished. All the photos are with my Iphone, I could not be bothered to lug about the "real" camera all day. All the school house sessions were great. 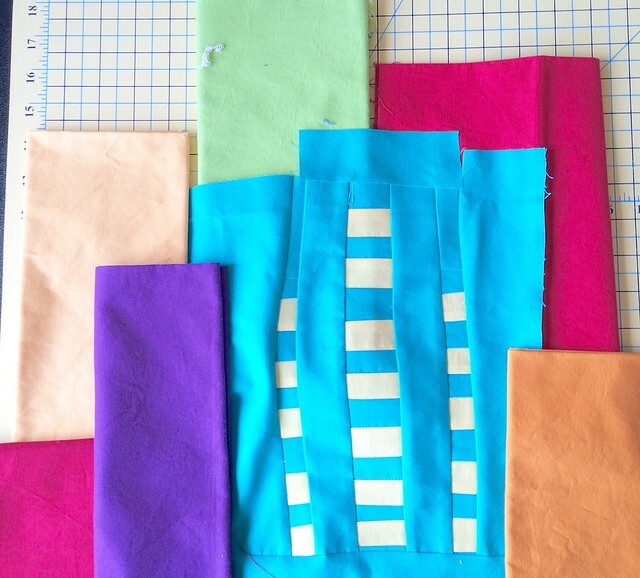 I was particularly inspired by Violet Craft who shared her pattern making process. I am thinking that lion would look great in a University dorm room and might make it for my youngest for this fall. Anna Maria Horner was in her booth on Saturday and I am glad I was able to stop and see her. It feels pretty special when Anna Maria recognizes you and gives you a big hug - she was one of my teachers at the Modern Quilt Guild's Sew Down Nashville. I am in love with her new woven fabrics. Her booth was also beautiful. I have to say that the photos of these fabrics showing up in stores sure don't do these beautiful fabrics justice, they are bright, textured and full of interesting touches. I will be looking around for all of them. 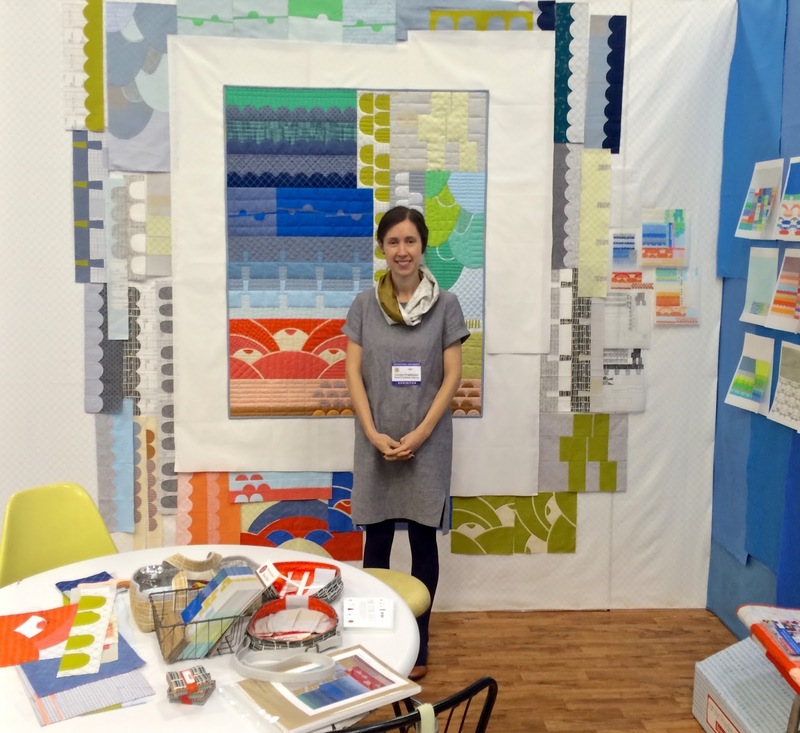 I adore Carolyn Friedlander, her fabrics and her patterns, as you know. It was lovely to stop and chat with her again too. She is standing in front of her new block of the month appliqué pattern/project. I expect you will see it popping up in many local and online stores. 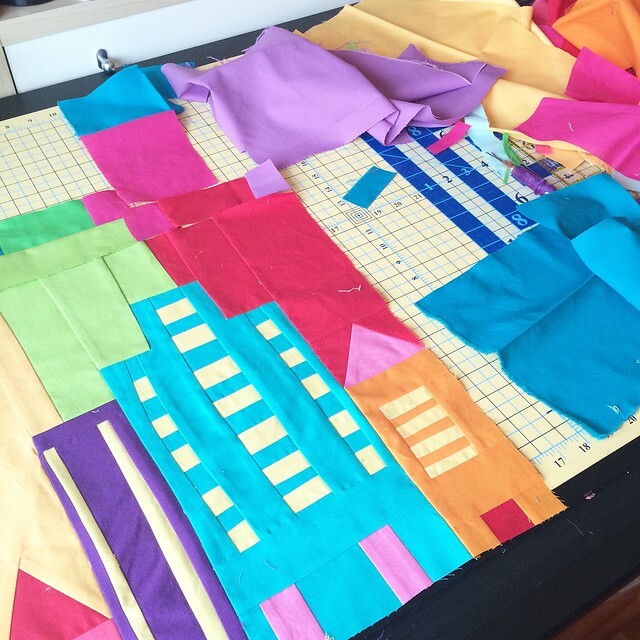 I have resisted appliqué so far, but this pattern is calling me big time - appliqué with learning progressively more complex techniques as you go and modern design, all at once. Quilt Market is a huge industry wholesale show - so one needs to be a retailer, designer, long arm quilter or other industry professional to attend. I walked about 15,000 steps to walk the whole floor on Saturday (about 9 kms). The booths are focused on showing off products to retailers. 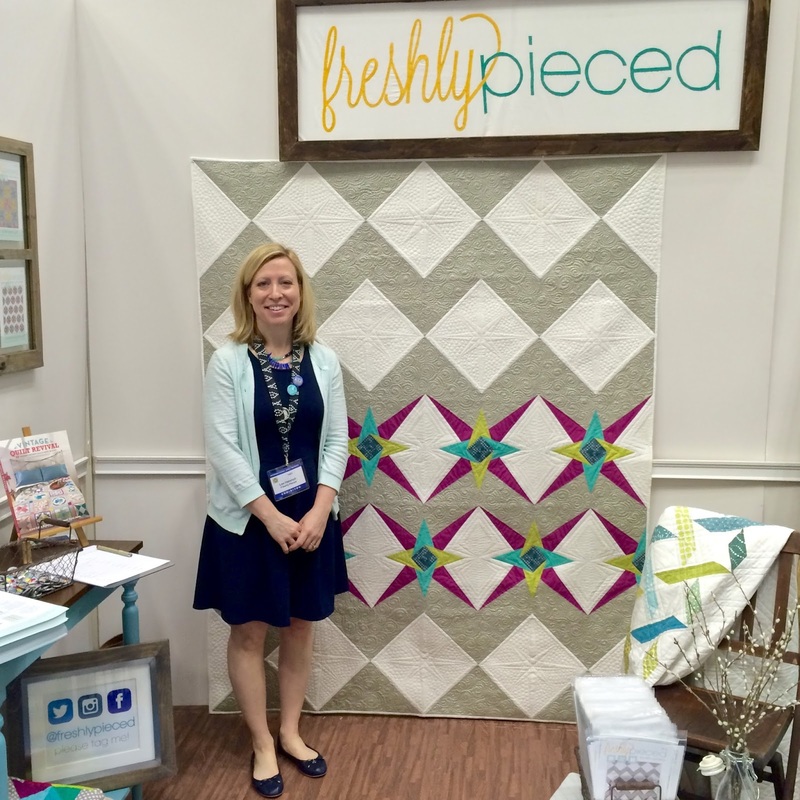 My friend Lee, from Freshly Pieced had this lovely booth to show off her patterns. Jen Kingwell was there with her lovely husband. 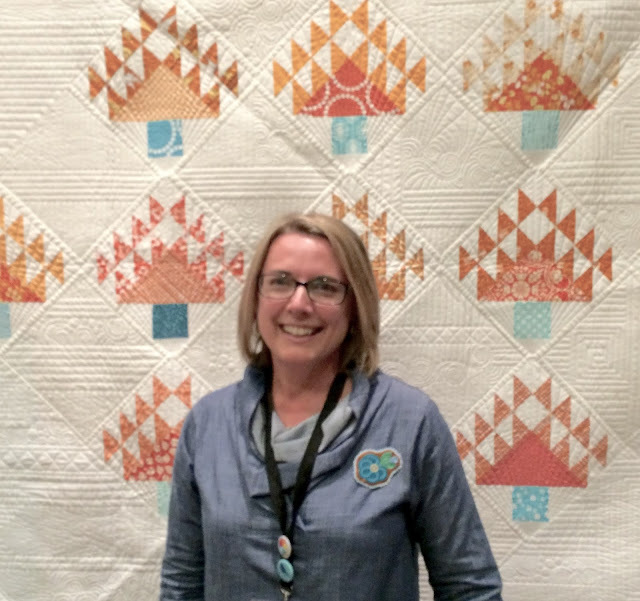 I was able to see the actual famous My Small World quilt and hear Jen talk about making it. 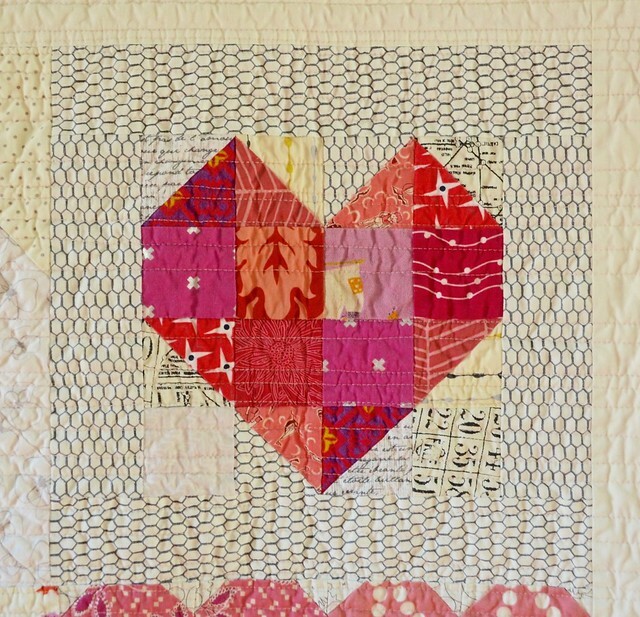 I have ordered the QuiltMania magazine from France as I really want to make this quilt - I'll have to work to catch up to the QAL, but that's ok. Again, not my usual style but irresistible all the same. The Martingale booth had this display of some of the projects in Make It, Take It, including my Half Moon Needle Case along with Amy's (During Quiet Time) Double Scissor Keeper and Krista's Bigmouthed Thread Catcher. I have to say I took far less photos this year. 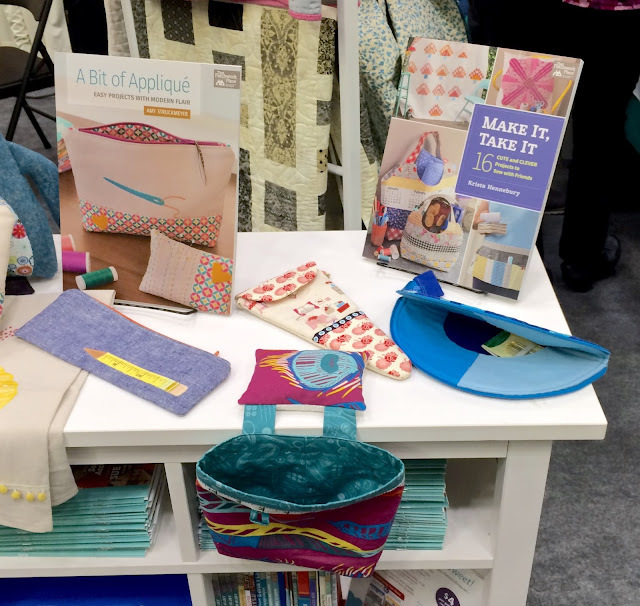 I enjoyed seeing the market and taking in the new products, meeting new people and catching up with those I met at the last market. It is an overwhelming experience and takes a long time to digest, but I am glad I was able to attend. I already posted my Sample Spree haul on instagram. 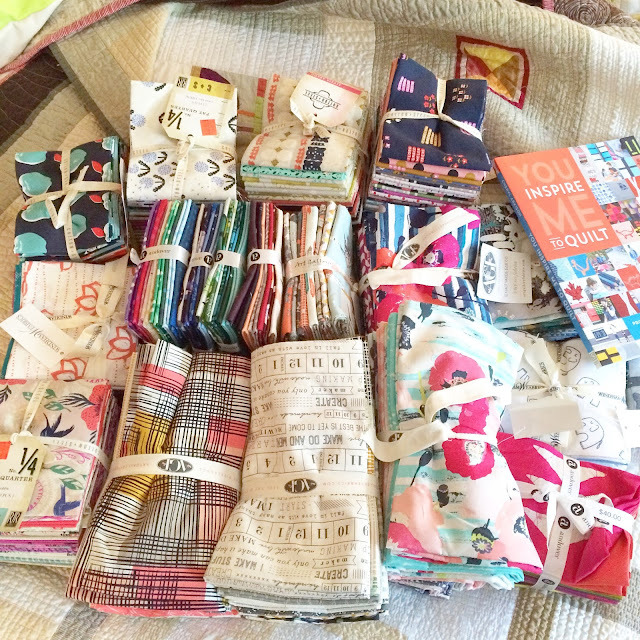 Sample Spree is a market when one can buy fabrics at wholesale prices. 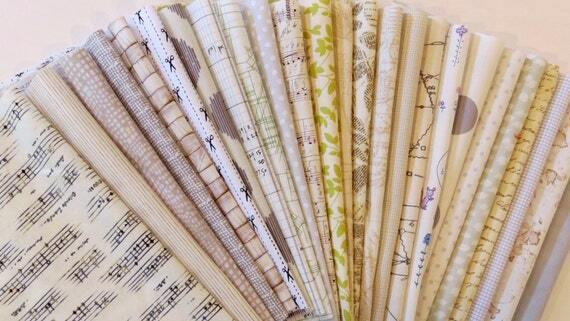 They don't have all the new fabrics on offer, but I did pick up a significant number all the same. You can see Cheryl's (Dining Room Empire) fantastic new book in the photo too. I was lucky enough to get to her book signing in time to get one and have it signed by Cheryl too. I actually went to market with one objective - to buy a rainbow of thread for use on my longarm machine and I think I succeeded. 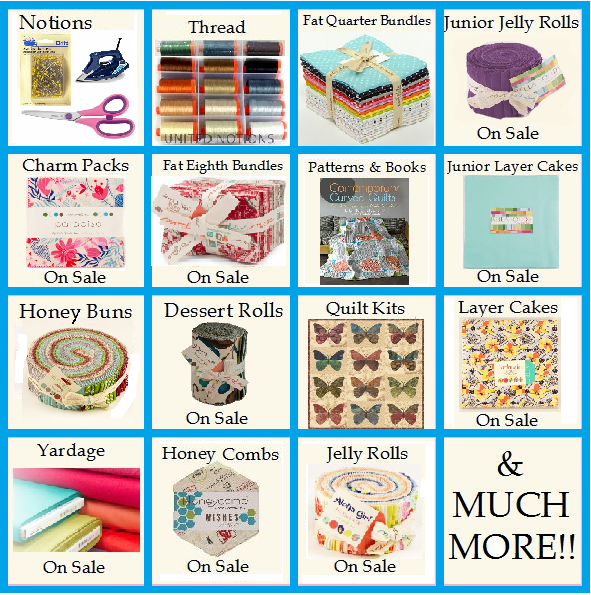 I got Aurifil 50 wt at Sample Spree - and I also won an Aurifil box at Vanessa Christenson's School House in a draw, I bought a rainbow of King Tut at the Superior Threads booth, and I got some beautiful variegated Star thread from the YLI booth on the enthusiastic recommendation of my friend Jacqueline from Soak. 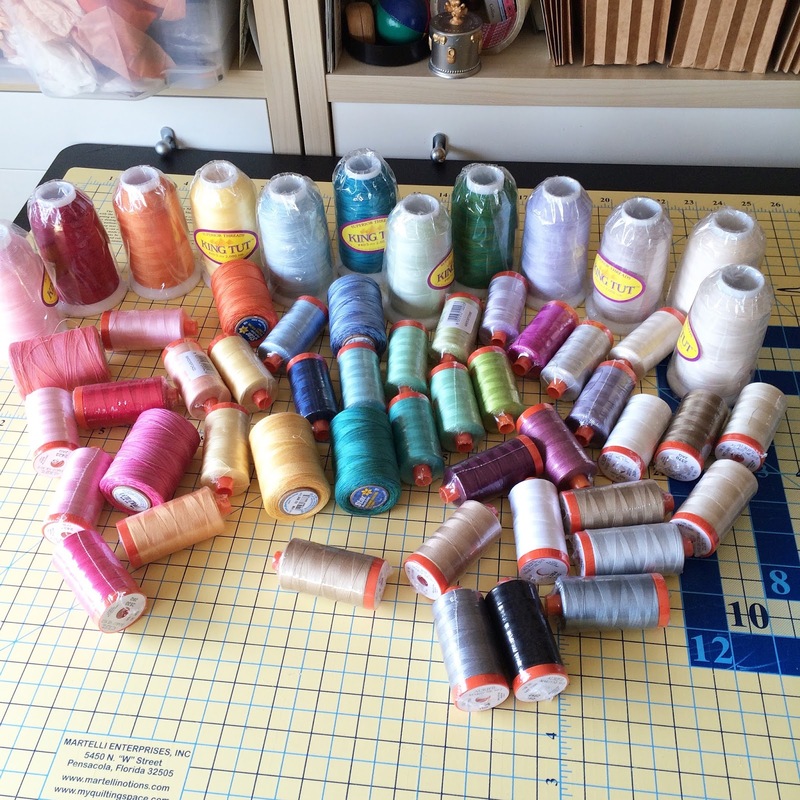 I think I will be good on thread for the next while. For those of you wondering, I was able to bring this all home in two suitcases (yes, I brought an extra) and given all the extra work travel I have been doing lately, I had even earned two free bags for the flight home. The best part about market was that I got to hang out with some of my friends - Becca from Sew Me a Song and Amy from During Quiet Time, Daryl from Fabric Spark, Krista from Poppyprint, Cheryl from Dining Room Empire, and many others, some of who I had never met in person before. 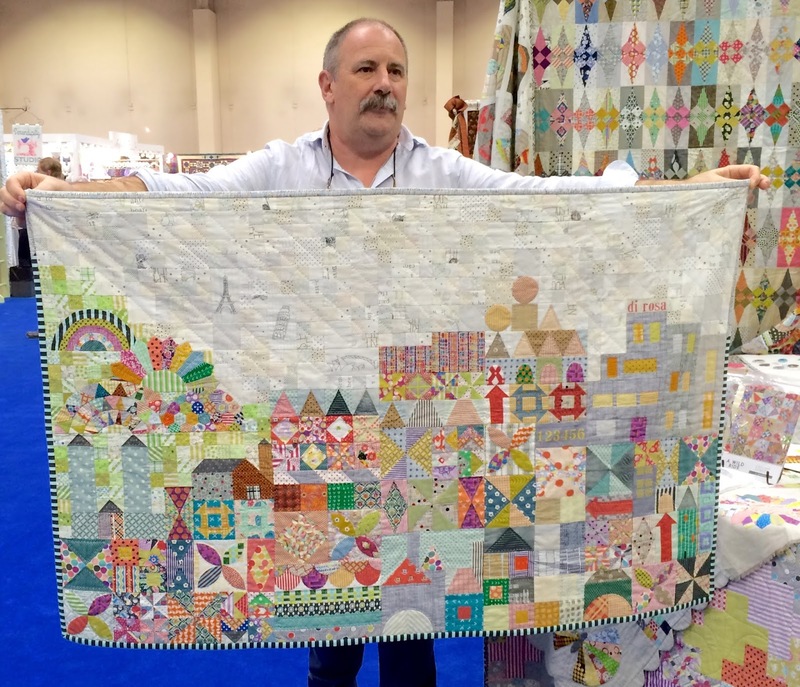 Given that the internet community of quilters is spread across the globe, these events become a lot about connecting with the people in addition to being about the products. I am off to enjoy the weekend, it is sunny and very hot here.